In June 2008, 11 million people were affected by flooding across the Midwest. That number represents the most people ever affected by a natural disaster in US history. Flooding is one of the most common natural disasters in the US. And they’re becoming more frequent than ever before. With this increased risk, it’s time for homeowners to seriously consider whether the costs of flood insurance outweigh the benefits. Whether or not your home is considered high-risk for flooding, you should consider flood insurance. Every home is in a flood zone map. If you already have flood insurance, you may be wondering why your premiums are so high and if there’s anything you can do to reduce the costs of flood insurance. The good news is, we’re going to tell you all about how flood insurance works, what it costs, and what you can do to reduce those costs. Keep reading for more information. Is Flood Insurance Covered by Homeowner’s Insurance? 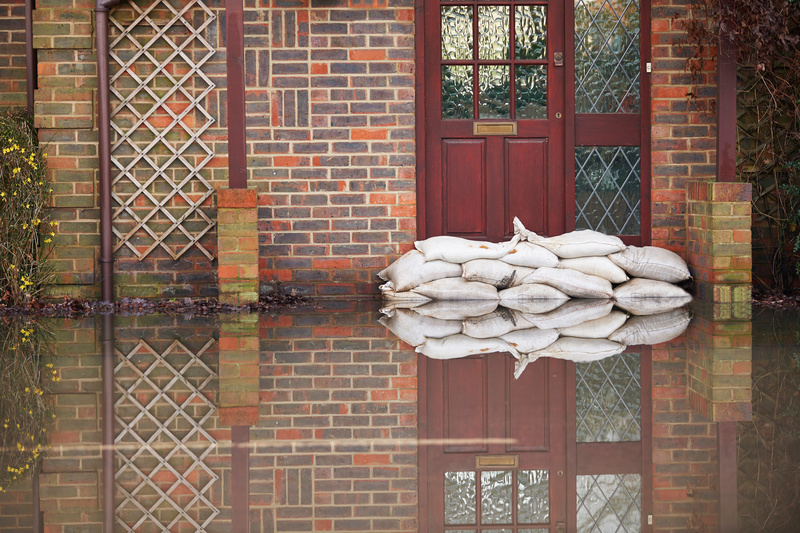 Homeowners insurance covers a lot of things but flooding isn’t one of them. sewer or water line backups that cause damage. When water damage comes from something inside your home or it originates in the sky, your homeowner’s insurance will help pay for the damage. But, if water has come into contact with the ground before causing damage, you’re not protected. So, in the case of flooding from creeks, rivers, or a flash flood, your homeowner’s insurance won’t help you. Do You Have to Have Flood Insurance? You only get protection from groundwater that causes damage through purchasing flood insurance. Some Americans are required to purchase a flood insurance policy. If you live in Special Flood Hazard Area’s (SFHA), you would have been required to purchase flood insurance before you could qualify for getting a mortgage. Higher-risk flood maps are zone A, AE & V.
If you live outside of an SFHA, (Flood zone X) flood protection is your call. Without it, you’ll be relying on disaster relief funds from the federal government. Disaster relief funds are loans. They’re low-interest but once you’ve taken one, you’re required to pay them back. AND you will be required to purchase flood insurance before you can get one of these loans. Since 1968, the National Flood Insurance Act meant that flood insurance is a responsibility of the federal government. Flood insurance was administered by the federal government and resold through participating insurers. This program was called the “Write Your Own” WYO program. Often people confuse the list of insurance companies with private flood insurance but they are only reselling the government program. Some of those on this list (State Farm Flood insurance, Allstate, Farmers, & Geico to name a few). Until recently there was a virtual a government monopoly over flood insurance. It kept insurance policy rates the same across all vendors. This has changed, but we’ll talk more about that later. Flood insurance acquired through the National Flood Insurance Program (NFIP) insure’s homes up to $250,000. You’re covered for up to $100,000 in personal property contained within the home. Renters can get coverage for up to $100,000 for personal property. Non-residential property can get protection up to $500,000. Condo Association Flood Insurance needs to be written with $250,000 per unit. If it is a new policy there’s a 30-day waiting period for flood insurance to kick in after it’s paid for. Which means you can’t buy insurance right before a hurricane and expect to be covered. Depending on where your home is located and how high the risk of flooding is, your rates can vary. Check out the FEMA flood risk locator to determine where your home falls in terms of flood risk map. How much does flood insurance cost in zone AE? In areas that are a higher risk for flooding (rate maps A, AE, and V), your coverage is going to depend on your home’s size, how it’s constructed, the foundation exactly where you’re located how much coverage you have and what your deductible is. FEMA is now offering sample annual rates of $533 a year for properties that are four feet above the BFE, $1,815 for properties that are at the BFE and $10,723 for properties that are four feet below the BFE. BFE stands for Base Flood Elevation are shown on Flood Insurance Rate Maps (FIRMs) and on the flood profiles. The relationship between the BFE and your properties elevation determines the flood insurance premium. Through the Government flood program. How much does private flood insurance cost? Lloyds of London Flood insurance can be 50% less. Cost of flood insurance on the Private flood options can be $71 a month. GREAT Price. Cost of flood insurance zone X? If you’re located in a low or moderate risk area for flooding, you may get a better rate with the NFIP policy. These are called Preferred Risk Policies. They come with a standard $1,250 deductible and are standard $250k/$100k for the coverage you want. I have seen premiums from $450 to $650 for your Primary residence, and $750 for a secondary home or commercial property. How Can You Reduce the Cost of Flood Insurance? The easy answer can be letting us shop your policy to the private flood options, including many of the Lloyds flood policies. Sometimes the NFIP once rated on an Elevation Certificate can be better. Below are some ways you can reduce the cost of flood insurance. Although this is not recommended it is a way to control cost. To reduce your premium, you can reduce what’s covered in your policy. Remove contents, and cover the minimum amount your lender will allow. This idea is risky, and might not be an option for you. Another option to reduce your costs is to increase the elevation of your home. 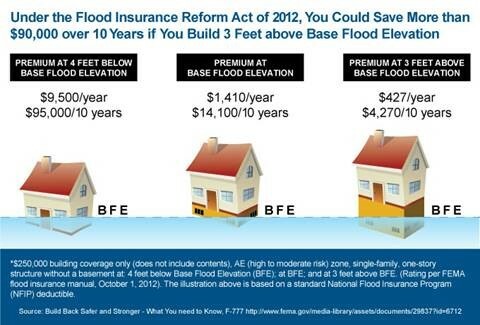 If you can raise your home’s Base Flood Elevation, it can save you a lot of money in premiums over the years. This can be done by adding proper flood vents on the bottom floor. Or Like we are seeing on the East coast raise the entire structure above the BFE. ns that have been developed for exactly these proactive measures. The minimum deductible is $1,250. But if you increase the deductible, you can save on premiums. You can increase your deductible to a maximum of $10,000 on the NFIP program. As a result of the NFIP’s monopoly on the flood insurance market, 98% of flood insurance is provided through the federal government. Many people aren’t aware that there are private flood insurance options available. For decades, the NFIP has over-charged half of its policyholder and undercharged the other half, and this practice now results with $42 billion debts and because the mismanaged program is backed by the treasury department the taxpayer paying the losses. Nationally 30,000 properties have flooded multiple times costing the program $5.5 billion. This is 3% of all the properties in the program when you do the math that means that 97% of the properties in high-risk flood zones could have less for flood insurance through the private flood insurance options if they have access to it. Private flood insurance is breaking up the monopoly on flood insurance. And competition drives prices down. However, not all private flood insurance options are equal so you really need to understand these policies or work with a flood nerd. The price you receive through the NFIP is based on standardized prices (one size fits all) that don’t vary by much across states. AZ, CA, CO, NM, residence pays the same amount as though on the east coast FL, NJ, NY, DE. They depend only on the value of your home and whether you’re in a flood zone risk map or not. Private flood insurance providers think that a lot more should go into an insurance policy. 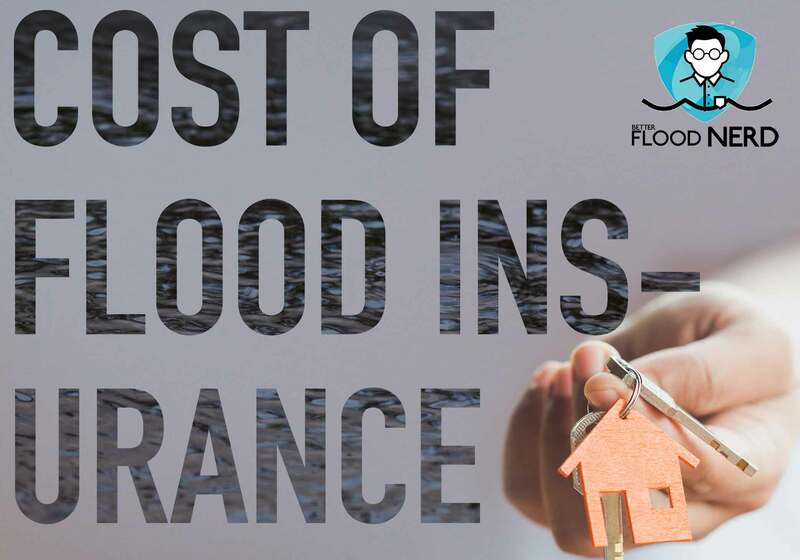 Not subject to the standardization of the NFIP, private flood insurance providers can save you money some Lloyd’s flood policies can save 50% over the NFIP. They can provide flood insurance at cheaper rates with more coverage and protect the risk correctly. They can also provide higher coverages than the NFIP. You can also use a private flood insurance in combination with your NFIP insurance. This is called Excess flood coverage and offers additional coverage to the $250,000 maximum provided by the NFIP policy. Flooding isn’t going decrease in upcoming years – in fact, it’s set to do the opposite. If the cost of flood insurance is what’s preventing you from protecting your home and your valuable, consider a private provider. NFIP vs Lloyds of London Flood Insurance. *All based on $250,000 Building (with No contents) and $5000 deductible. You will need to need to apply to see if we can get these rates.